Osteosarcoma is a highly malignant tumour arising within the bone and spreading rapidly outwards to the periosteum and surrounding soft tissues. It is said to occur predominantly in children and adolescents, but epidemiological studies suggest that between 1972 and 1981 the age of presentation rose signiﬁcantly (Stark et al., 1990). It may affect any bone but most commonly involves the long-bone metaphyses, especially around the knee and at the proximal end of the humerus. The tumour is usually situated in the metaphysis of a long bone, where it destroys and replaces normal bone. Areas of bone loss and cavitation alternate with dense patches of abnormal new bone. The tumour extends within the medulla and across the physeal plate. There may be obvious spread into the soft tissues with ossiﬁcation at the periosteal margins and streaks of new bone extending into the extraosseous mass. The histological appearances show considerable variation: some areas may have the characteristic spindle cells with a pink-staining osteoid matrix; others may contain cartilage cells or ﬁbroblastic tissue with little or no osteoid. 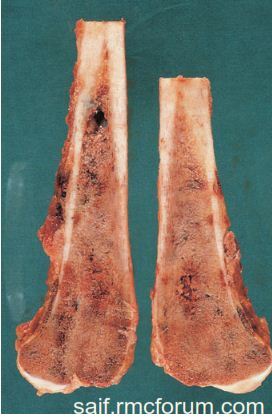 Several samples may have to be examined; pathologists are reluctant to commit themselves to the diagnosis unless they see evidence of osteoid formation. After few months, swelling is seen at the affected side which is somewhat spindle shaped. Bone will be immature, osteolytic lesion in the metaphyseal region with concomitant osteoblastic reaction or new bone formation at the elevation of the periosteum. New bone formation at the margin of tumuor and normal bone under the periosteal site forming a triangle shaped new bone formation called Codman’s triangle. Though the tumour is highly aggressive but almost to the last stage of the tumour the bony architecture is more or less maintained. As the tumour is highly aggressive and osteoblastic and osteolytic reaction occurs concomitantly and the periosteum and into the soft tissue thereby flecks of new bone formation will be seen at the right angles to the long axis of the bone. On x ray looks like Sun-ray or Sun-burst appearance. 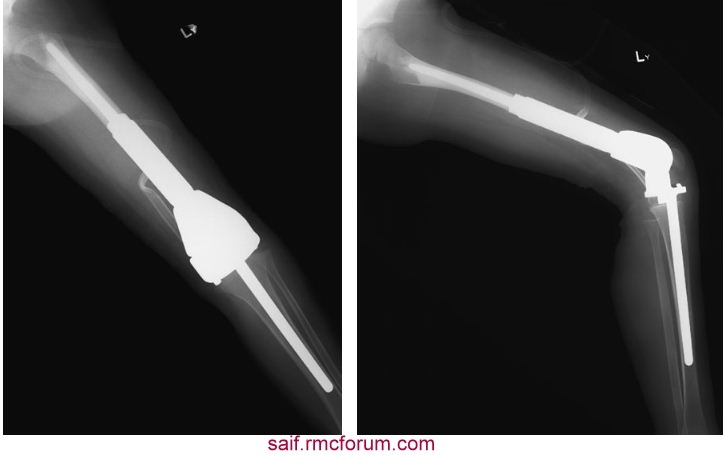 This is a low-grade sarcoma situated on the surface of one of the tubular bones, usually at the distal femoral or proximal tibial metaphysis. The patient is a young adult who presents with a slowly enlarging mass near the bone end. This rare tumour is quite distinct from parosteal osteo sarcoma. 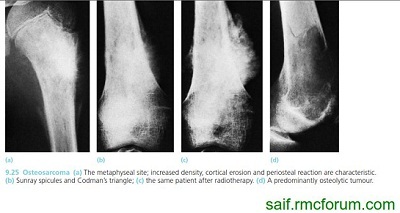 It is more like an intramedullary osteosarcoma, but situated on the surface of the bone. It occurs in young adults and causes local pain and swelling. Diagnosis must be confirmed and extension of the tumour should be diagnosed. Radical excision: amputation and disarticulation for that excision of the tumour tissue with its whole compartment followed by prosthesis. How good the fate is chiefly depends on the stage of tumour and how early treatment has been started. If tumour is localized, 5 years survival rate is 70-80%. If osteosarcoma is metastasized to lung, 5 years survival rate is about 43%. If osteosarcoma is metastasized to multiple organ, 5 years survival rate is 20-30%. its just an awsome post on osteosarcoma, I found an apley's book on library that encircle the codman's triangle. Its just great, I think you should do that too!